Accessories make the look consistent and original according to Yves Saint Laurent. If the hats, veils and gloves are left in the past, the bags and clutches in turn remain the must-have for any woman. The matching clutch is an inalienable part of any evening look. The Golden Globe Awards could boast the variety of these stylish accessories. Celebrities were demonstrating the striking outfits accessorized with high end jewelry and matching clutches. This time they appeared with the clutches of the distinct shapes, textures and colors, from the gold and shimmery ones to the sophisticated classy ones to match their evening gowns. 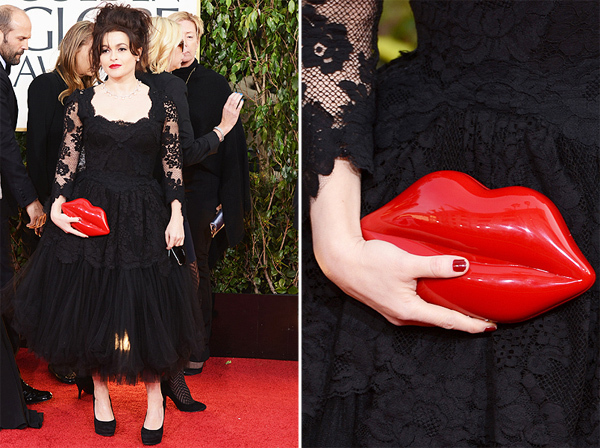 One clutch I want to mention is the one held by Helena Bonham Carter: she appeared on the red carpet carrying the clutch in the shape of red lips. So, if there would be a special award for the best clutch, she would become an unquestionable winner. Jessica Alba appeared on the red carpet holding the feather clutch in the matching color, which looked both original and playful, whily Emily Blunt and Rosario Dawson went for the sparkling clutches.